We are moving forward creating a new campus for the English in Mind Institute (EIM) in Port-au-Prince, Haiti! Above: EIM student and teachers hold informal classes and meetings on the land for the new campus. Adult learners study for English fluency in a 5-year curriculum developed by Cambridge University. With 6 mango trees, a papaya tree and several food-producing gardens in which students share and practice permaculture techniques, this lush sanctuary is a beloved hang-out. Design Update: In our next meeting with the client, we will discuss cost, availability and time regarding structural system options. After final decisions from the Board of Directors based on our discussions, the design team will move forward with Construction Documents and renderings for release at the annual EIM “Back To School” fundraiser in September. Non-Profit Construction Partner: The EIM has partnered with the Building Goodness Foundation (BGF) to realize their new campus. The mission of BGF is to build community and improve lives. It is a not-for-profit created by successful for-profit designers and builders in Charlottesville, Virginia. Together, they have successfully constructed 17 community structures in Haiti so far, most of them in rural areas. EIM’s new campus will be their first project in an urban area of the capitol city. We are excited to learn about their successes in Haiti construction and utilize their existing relationships and partnerships. 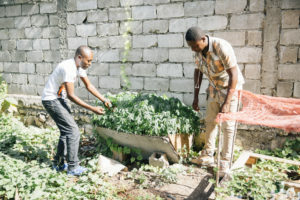 I am particularly inspired by their teaching model: skilled construction volunteers travel to Haiti for week-long shifts on community construction sites. On the first day, they might be demonstrating or teaching a particular skill, and over the course of a week of on-the-job mentoring, the volunteers transfer skills to the local crew so that they are able to continue with that phase (to a comparable quality level) long after the volunteers depart. It’s a great way to share safe construction practices, based on the principles of apprenticeship and friendship. Solar Potential: BGF has recommended a solar consultant to us that they have collaborated with on several projects in Haiti. Although the EIM Campus is located in an urban environment with access to power lines, power is inconsistent and blackouts are regular. Generators are large and produce exhaust, which is less than optimal on our tight urban site. The solar consultant has recommended Australian compact salt water batteries that last four times as long as standard batteries, without worry of toxicity or heat production. We are also seeking a Haitian PV panel producer so that repairs can be made for the longevity of the system. Creating high-tech solutions does not necessarily solve the problem – sending technology systems through shipping ports is costly and not delivery is not assured. Additionally, one small problem in the field will render the entire system useless if local technicians are not trained / have not seen the components before. Likely, we will install conduit for solar now and confirm potential load production and roof tilt while we try to allocate a reasonable solution. Mural Competition: As we approach the building’s design release, we will be also be providing information for a design competition among EIM students! Thoughtfully designed murals will line the double-height walls of the Assembly Space. The Assembly Space is especially important because it not only serves the school, but becomes a venue for special events after hours. This revenue will sustain school operations for the long-term. We are delighted to reveal the selected mural in final renderings of the campus during the design release at EIM’s September annual fundraiser. Thank you to Brunel Zamor for inviting us to realize his dream of the best adult english school in Haiti. Thank you to Kamilla Prokop, Chris Kiely, Stephanie Price, Bonni Knight and the board of EIM for inviting us to participate and working so hard to realize the funds for construction. Thank you to Dante Angelini and Tom Quintero, who continue to squeeze in volunteer time during a construction boom and long office hours in Austin, Texas. Thank you to Ethan Tate and Mike Gallahue for providing insight and experience from their years in Haiti, and for laughing at my corny jokes. And thank you to all the donors for helping EIM’s Campus come true!